Framing the river’s edge with a new language of development appropriate to riverside activities: Riverbanks are encroached upon or abused because there are no exemplary models on how to use them. 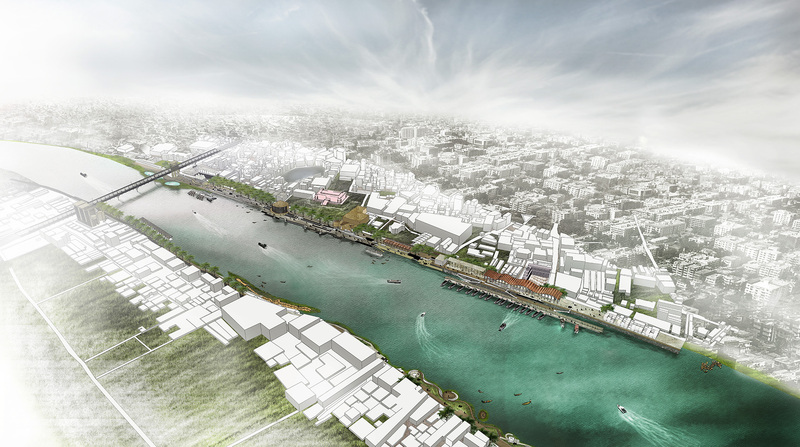 An appropriate riverside development will create a defined overlap between city and river, something which is now lacking. 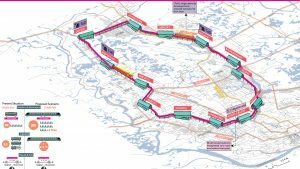 Connecting north and south riverbanks with a continuous public promenade: For a first phase, a promenade may link Sadarghat launch terminal to Badamtoli ghat, and via the bridge make a loop to the riverbank on Keranigonj. 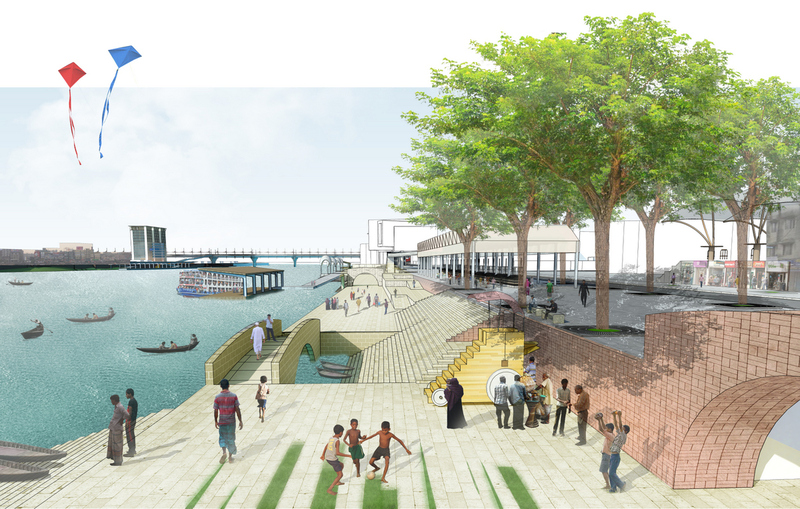 Walkways, ghats, terraces, gardens, floating islands, and pavilions will form components of that riverside promenade. 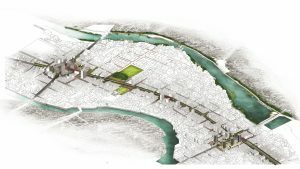 Connecting civic and historic buildings and their sites, and newly proposed public and commercial centers, and large parks and gardens with new public pathways. 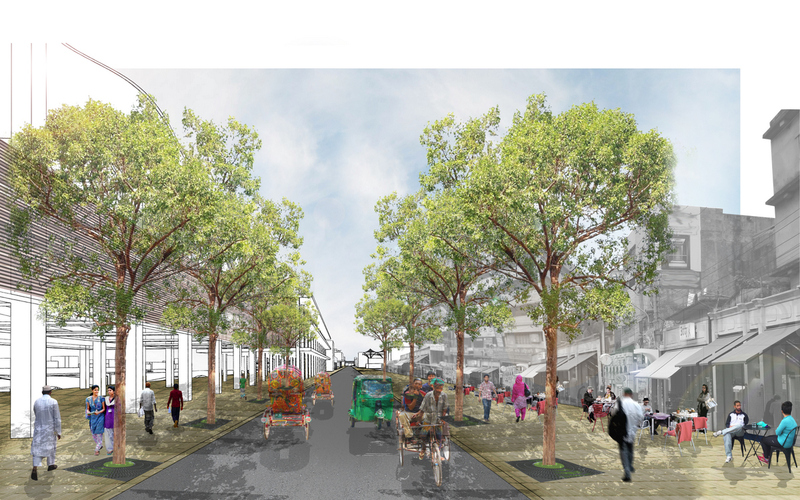 A new generous plaza – Sadarghat Chottor – is proposed in front of Sadarghat terminal as a public gathering space and forecourt to the terminal where passengers and visitors may assemble. The terminal building can be renovated as a porous and transparent building with better efficiency as a passenger hub and visual connection to the river, as well as a landmark structure on the riverbank. 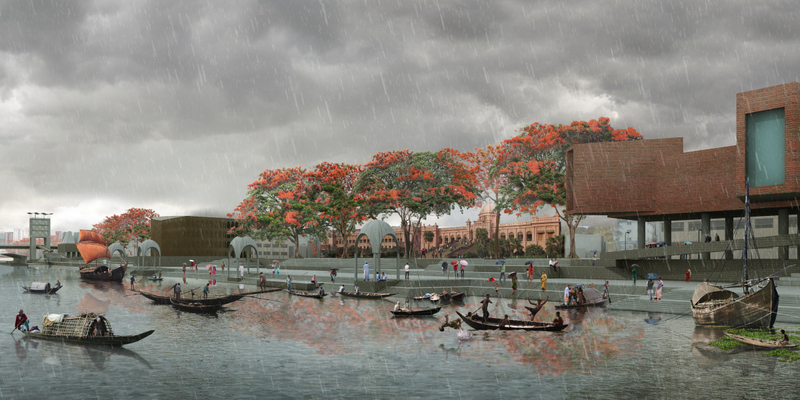 Generating an active water-based transportation by creating ghats and stations for river-buses and river-taxis: By bringing travelers and tourists from other parts of the city, stations can become hubs for new economic and cultural activities in the neighborhood.